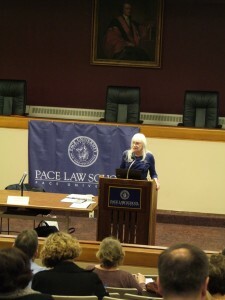 On Wednesday, November 2, Pace Law School’s Center for Continuing Legal Education presented an update to special education case law in New York State. The program was delivered by BJ Ebenstein, Esq., a Pace Law graduate and a nationally recognized leader in the special education field as a parent, advocate, parent attorney and NYS Impartial Hearing Officer. She recently presented at the NYS Bar Association, and annually conducts a trial practice program for the national advocacy group COPAA. The Nov. 2 program was attended by heads of special education from New York, Connecticut and Washington, D.C. It was also webcast live. An archived video of the program will be available here. Advocates, parents and attorneys were walked through the pertinent cases and their implication for students, schools, advocates and hearing officers. “It was an outstanding program, and a feather in the cap of Pace CLE to be able to tap experts like BJ Ebenstein,” remarked Gilbert K. McMahon, Esq., Pace Law School alumnus and an attorney at McMahon Advocacy Group in Mahopac, NY.